1.1 This specification covers high-strength low-alloy structural steel shapes, plates, and bars for welded, riveted, or bolted construction but intended primarily for use in welded bridges and buildings where savings in weight or added durability are important. The atmospheric corrosion resistance of this steel in most environments is substantially better than that of carbon structural steels with or without copper addition (see Note 0). When properly exposed to the atmosphere, this steel is suitable for many applications in the bare (unpainted) condition. This specification is limited to material up to 8 in. [200 mm] inclusive in thickness. 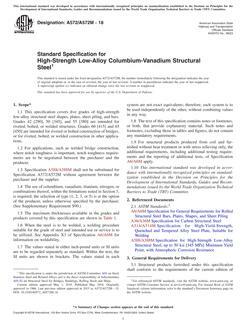 Note 0For methods of estimating the atmospheric corrosion resistance of low-alloy steels, see Guide G 101.